As discussed previously on the New York Court Watcher (see New York Court of Appeals: The Jones Factor in Criminal Cases, August 8, 2008), the decisional record of the New York Court of Appeals in criminal cases has shifted significantly in a pro-defendant direction since the appointment of Judge Theodore Jones in February 2007. The above graph illustrates the shift. As shown on the graph, the court adopted a pro-defendant position in 32% of the divided criminal cases in the five-year pre-Jones period. It did so in 39% of those cases in the immediate two year pre-Jones period. Those figures contrast markedly with the 63% since Jones' appointment. Also particularly notable are the voting records of Jones' colleagues since his appointment. Cuomo-appointed Chief Judge Judith Kaye and Judge Carmen Ciparick have both been voting 69% pro-defendant. And Pataki-appointed Judge Robert Smith has also compiled a pro-defendant voting record--56%. 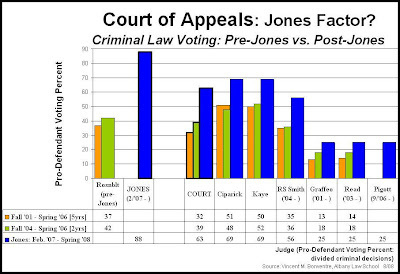 Hence, four of the judges, a majority, have pro-defendant voting records since Jones' appointment. Three of those records--Jones', Kaye's, and Ciparick's--are significantly pro-defendant. The remaining three members of the court--all Pataki appointees--Judges Victoria Graffeo, Susan Read, and Eugene Pigott, have strongly pro-prosecution voting records. They have each voted 25% pro-defendant since Jones' appointment. There is much else to note in the decisional and voting records depicted on the graph. Suffice it to say that on the seven member New York Court of Appeals, three of the judges compiled strongly pro-defendant voting records in the year and a half since Judge Jones joined the court: Kaye, Ciparick, and Jones himself. Additionally, the voting record of Judge Smith reveals that, more often than not, he too has been siding with the defendant in the difficult, divisive cases. Indeed, he has been voting for the accused twice as frequently as the other three Pataki appointees, Graffeo, Read, and Pigott. And the result, as we've been discussing, is that the court has been deciding cases in favor of the accused much more frequently than it was previously. Jones' 88% certainly seems to be a factor.